This was from a time when the entire nation was 100% behind our troops… even our media. March 1942… here in southern California. 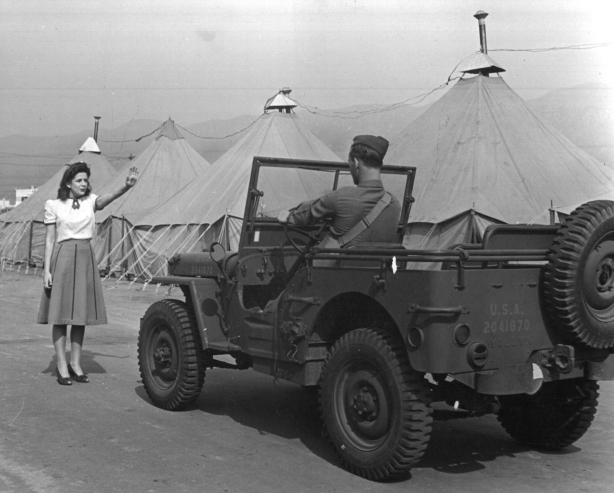 She, an aspiring starlet named Marilyn Hare, was determined to kiss 10,000 soldiers in early 1942 and while doing so, boost morale… Not only for the troops facing an uncertain future but the country. At this time, the news was filled with the conquests of the Japanese military in the Pacific. The Doolittle Raid and the Battle of the Coral Sea would not happen until the following month. Times have changed yet our young are still sent to war. For the uplifting photo series of this kissing wonder in LIFE, please click here. First class. Awesome. Fantastic. Honorable. I was in humble disbelief. Delta is my airline of choice…and I had many reasons for choosing Delta. Now, I have another reason. And I am grateful. Delta has an Honor Guard. That’s right. An Honor Guard. Look at the passengers behind the glass. They were fortunate to have watched. Imagine what they were feeling. I wish I had the opportunity. What do you all think about this service…from an airline? Unretouched image of Uncle Suetaro’s band. 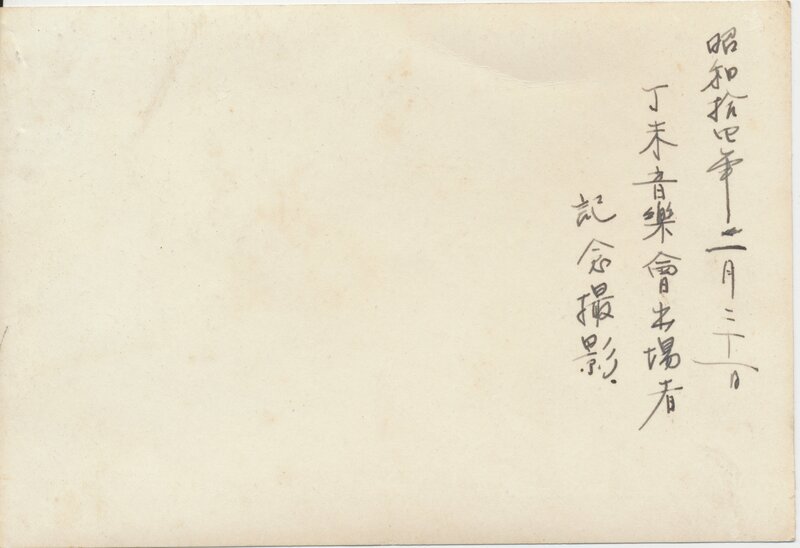 My father’s decades old story about how he broke his elbow became the topic in the earlier story, “正覚時” (Shoukakuji). Shoukakuji is the name of the Buddhist temple – a hop, skip and a jump from my father’s family home in Hiroshima. 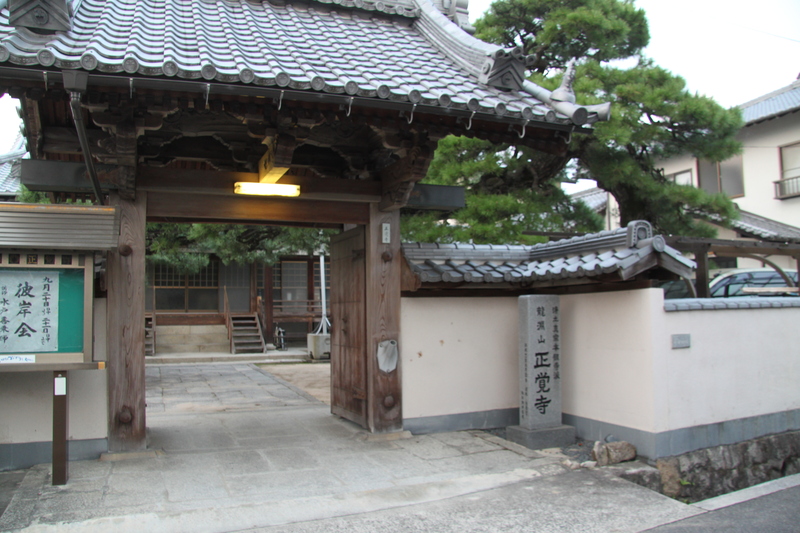 Temple entrance. My father’s home is behind me and to the right. The temple’s reverends supported my family’s religious needs for over a century now. Funeral services for my grandparents and my father’s siblings. Including my Aunt Shiz just this last September in “The Spirit of Aunt Shiz and Kharma“. Including my Uncle Suetaro who was killed in action as an Imperial Japanese Army soldier on Leyte in the Philippines. When Masako-san, my son Takeshi and I walked to the temple in 2013 to investigate my dad’s story of how he broke his elbow, we were greeted by the Reverend. He was 90 years old and still had his wits about him. While he did not recollect my father, he validated the placement of a large round rock under the pine tree that hasn’t been touched for as long as he’s lived at the temple…. And that’s a loooong time. I’m sure he was born there. 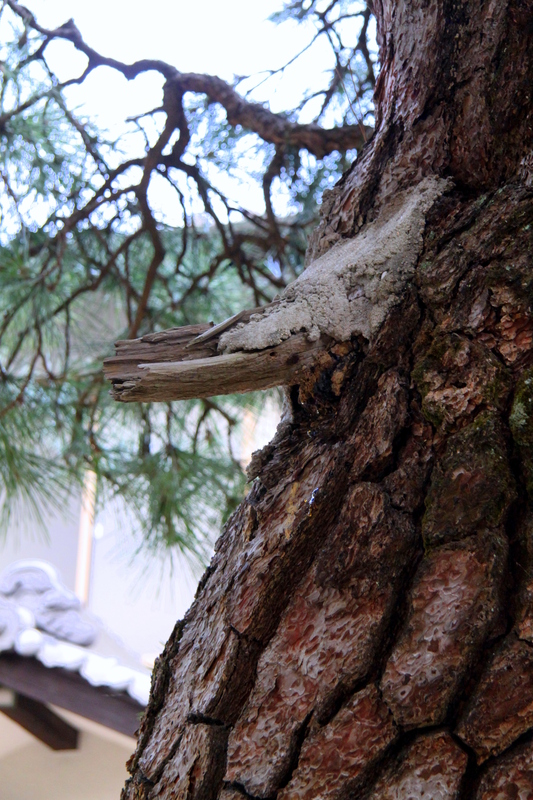 And that there was a big branch of a pine tree that has since broken off recently. He said he knew my Aunt Mieko who died in 1939. And miraculously, he mentioned Uncle Suetaro. The reverend said they played together as children and that he was always a jokester and smiling…and that he could hear him playing his “fue”, or flute, from his second story room at the house. Until then, not even Masako-san knew Uncle Suetaro played a flute…but there was no proof. Just the recollection of a 90 year old reverend. My tennis elbow pain kept me from retouching the old vintage photographs I had brought back from Hiroshima last September. And the project was at a standstill since late October. That was as depressing as Obama V2.0. But from three weeks ago, I am attempting to slowly restart the retouching project as my elbow pain has subsided greatly…and I came across the group photo you saw at the beginning here. As retouched. Uncle Suetaro is the slightly taller one just to the left of center. If you click on the image, it will enlarge. Look in his right hand. But as I enlarged the image to begin retouching, something caught my (old) eye. I noticed Uncle Suetaro was clutching something in his right hand. A case more slender than the others in the group picture. It’s not a trumpet or a trombone, that’s for sure. Or for a cue stick. It sure looks like a flute case. Oh, heck. It IS a flute case. So words from the mouth of an old reverend started an eighty year old circle… to this vintage photograph of young boys. All of whom likely lost their lives in a violent war. As did my uncle who played a flute. In the past several years, as his dementia progresses, Dad is repeating many times how he broke his elbow as a young boy… “Many times” like as in every four minutes. No…every two. Well, I just HAD to find out about his story… and I did. The story (which never varies) is/was he was playing “oninga”, or tag, with the neighborhood kids. “There was nothing else to do then,” he would tell me. 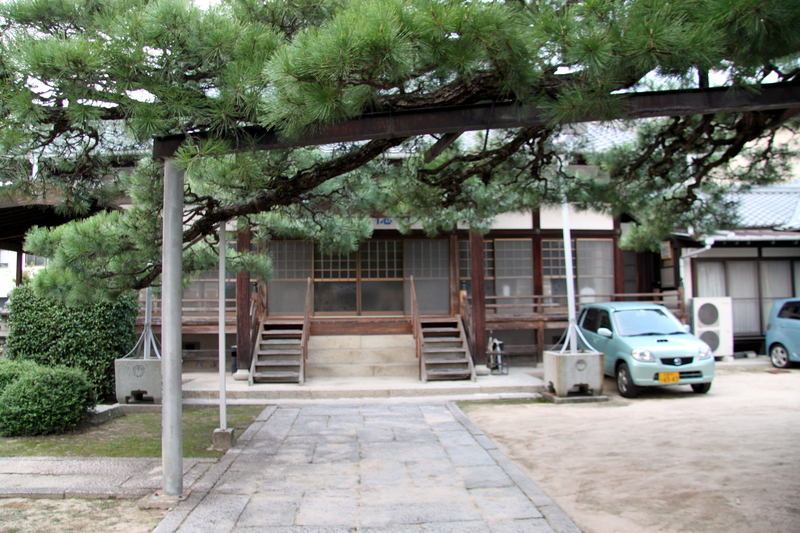 They would end up in the yard of 正覚寺 – pronounced “Shoukakuji” – the Buddhist temple which is a hop, skip and a jump from his home. No wonder he excelled in the triple jump at Nichu. You can see a tiled roof on the tallest structure to the right of him. That is 正覚寺. The tiled roof of “Shoukakuji” can be seen behind and to the right of Dad in this 1948 photo. He is standing alongside his childhood home. 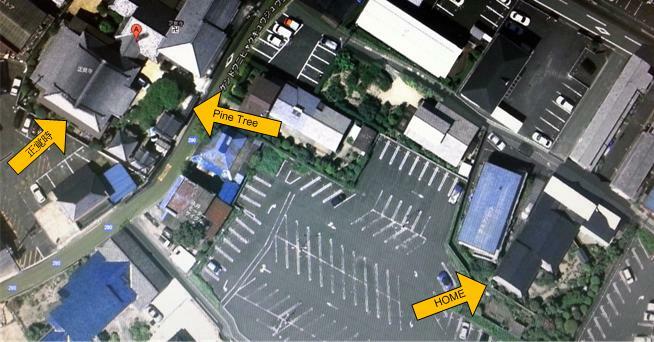 Satellite view of home and Shoukakuji, 2012. “Trouble is, I jumped too far so my hands couldn’t grab onto the branch. I slipped off the branch then broke my elbow when I hit the ground”. To this day, he cannot completely straighten out his right arm. It’s crooked. He now tells this story to my youngest kids, Jack and Brooke… Every four minutes. On September 7, 2012, I had to know. Off to 正覚時… But unlike my agile father of the 1920’s, I was walking very gingerly. There were four humongous blisters on my toes from walking in Japan and (from being tricked into) climbing Mt. Misen on Miyajima. The sign at the entry gate, or “mon”. 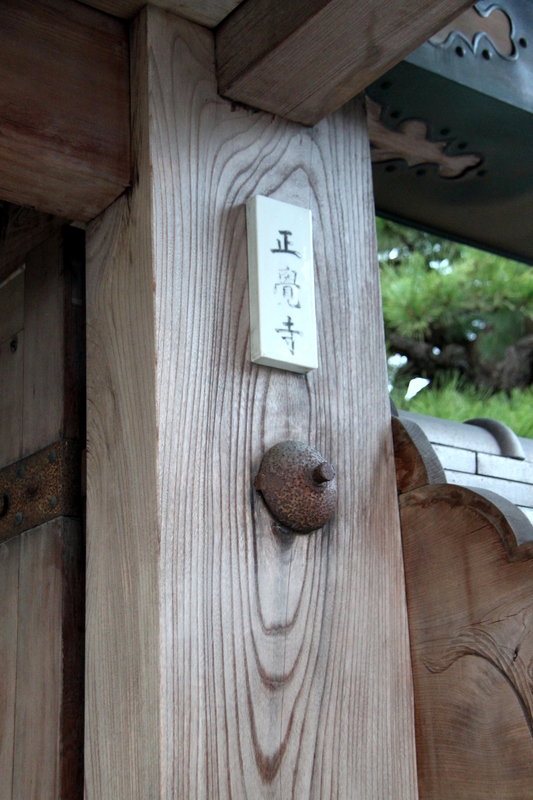 Shoukakuji’s middle character is written with an old Japanese character. 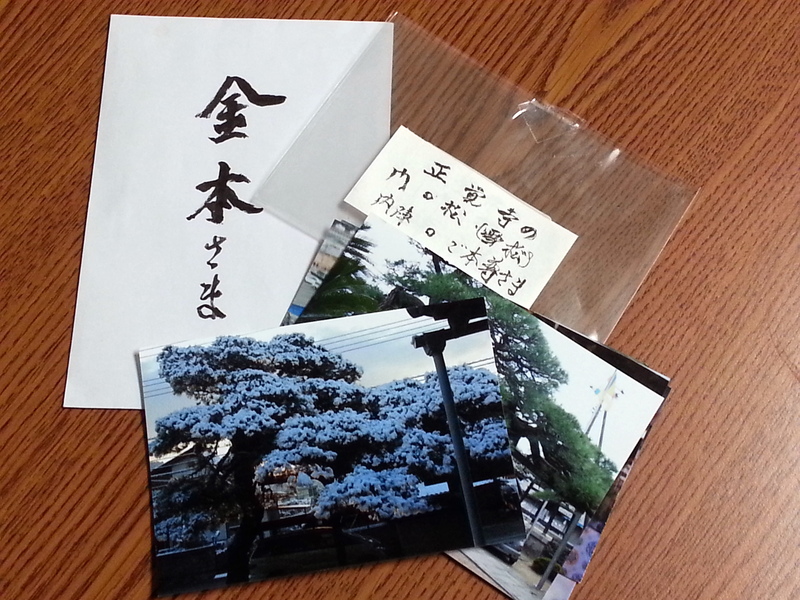 Indeed, there was a Japanese pine tree, or “matsu”. A huge one. You couldn’t miss it as you walk through the “mon”, or gate. It was so huge, the temple had steel braces installed to help hold these majestic branches up. Steel posts and braces were installed to help hold up these ancient branches. Off the to right, was the base of the tree. A puny trunk in relation to the Goliath branches… It was hard to believe at first this small trunk was the heart for this proud tree. Then… at the base… was a large round stone. Could it possibly be? Plausible as we don’t know how long the stone was there… Am I tough? 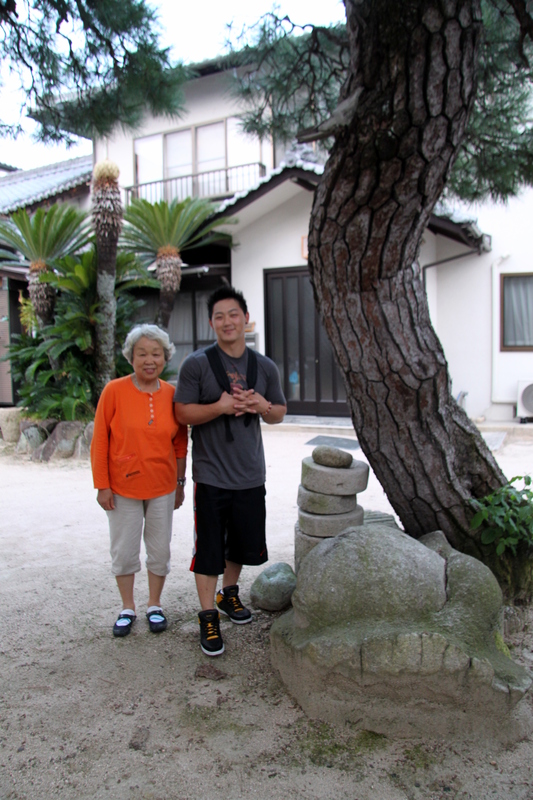 Masako and my son Takeshi stand next to the large round stone and pine tree made famous by my father some eighty-plus years ago. But where’s the branch my father jumped for? Myth: Busted!… or so I thought. Then we saw it. Above my son Takeshi in the picture. The base of a broken branch. It was at the right height! OK… Myth: Plausible. Here is the branch that Dad supposedly leaped for 80+ years ago…but fell and broke his elbow. Then, as if Aunt Shiz summoned him, the reverend of 正覚寺 came out…with his wife. He was about 90 years old. Almost as old as my dad but he still had his wits about him. Thank goodness. He told us he didn’t know my father personally…but that he played with Suetaro and Mieko, Dad’s youngest brother and sister! He knew Suetaro well, he said. He listened to Suetaro blow on his flute from the house in the evenings. 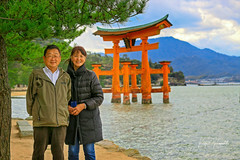 My Japanese wasn’t good enough so Masako stepped in… She explained to the elderly reverend how my dad (her uncle) had jumped from a large round stone at the base of a pine tree here 80+ years ago and broke his elbow. 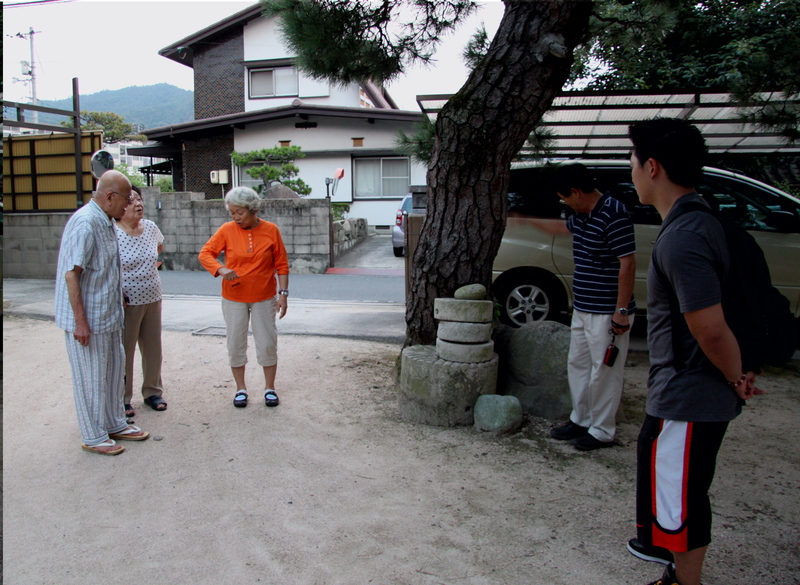 Masako is mimicking my father’s broken right elbow and his story while my son Takeshi and cousin Kiyoshi watch. Kiyoshi was pointing to the stone to supplement the story. Then the wife said that a number of years ago, the branch had broken off but it was very long. Then after it broke off, “…a swarm of bees made a home inside. We had to seal the crack unfortunately,” to account for the mortar on the branch. Was his story a myth? Busted? Plausible? Confirmed? Dad wasn’t imagining ANYTHING. His memory is intact from that time. But to end this fun story, we had my Aunt Shiz’s interment the next morning. The reverend’s son brought this gift for Masako and my Dad. A photo of the majestic Japanese pine tree covered in snow. There are souls in this tree, too. Oh… I was kidding about Mythbusters. World War II Military Intelligence techniques are still important and in use today – but for entirely different reasons. During the war in the Pacific, US military personnel were forbidden to keep notes or diaries in the event they were captured. Nothing more disillusioning to be captured or killed, then have the enemy read about the ammo dump you just left from. Especially for your buddies still stationed there. 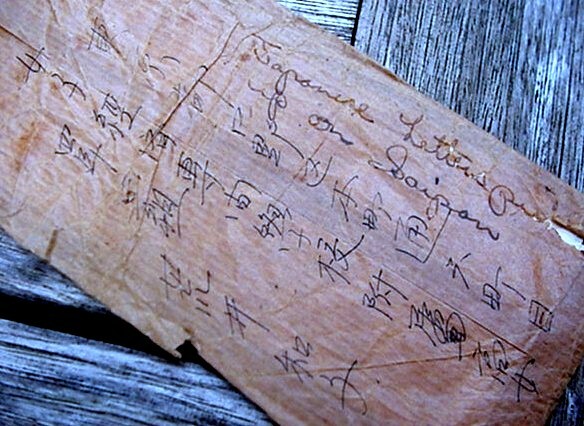 On the other hand, Japanese soldiers were allowed to keep notes or diaries. Apparently, the Japanese military saw the diaries similar to “water cooler gossip” at the office. That was their downfall as Americans like my father translated such documents. The Military Intelligence Service. 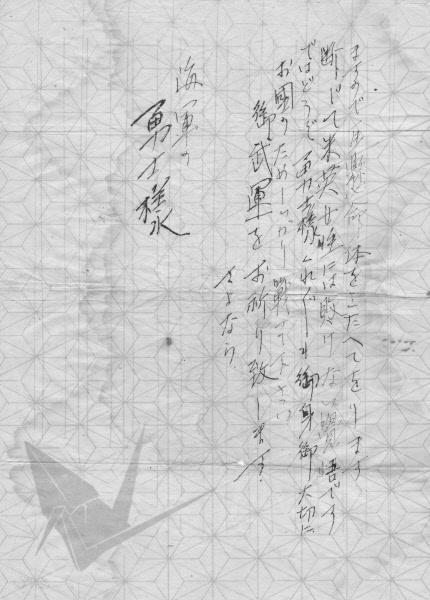 It was from these diaries that the Allies first began to see that the enemy were not the samurai of lore. They had gripes of their commander – even by name. They complained of starving, no ammunition, no water. They also had uncensored letters from home – their families were starving, sick or had no home left for the soldier to come back to. A mortar crewman wrote of how terrified they were to launch a mortar shell at the Marines as for every round they fired, the Marines would send ten back their way. The MIS did their job faithfully back then on those hell hole islands. Their job was to help kill the enemy. Today, albeit in a roundabout way, MIS veterans like my father are still doing their job. Last week, a representative of the “Japanese American Veterans Association (JAVA.org)” contacted me again to enlist the help of my father. As mentioned in an earlier short story, Dad was a “kibei“, or an American of Japanese descent who got schooling in Japan. He was fluent. More so, he still is fluent in reading the pre-war Japanese writing. There really aren’t that many left with this ability. Dad is 93. Unfortunately, Dad had a bad fall the day the request came in. He fell flat on his face and shattered his glasses in the process. 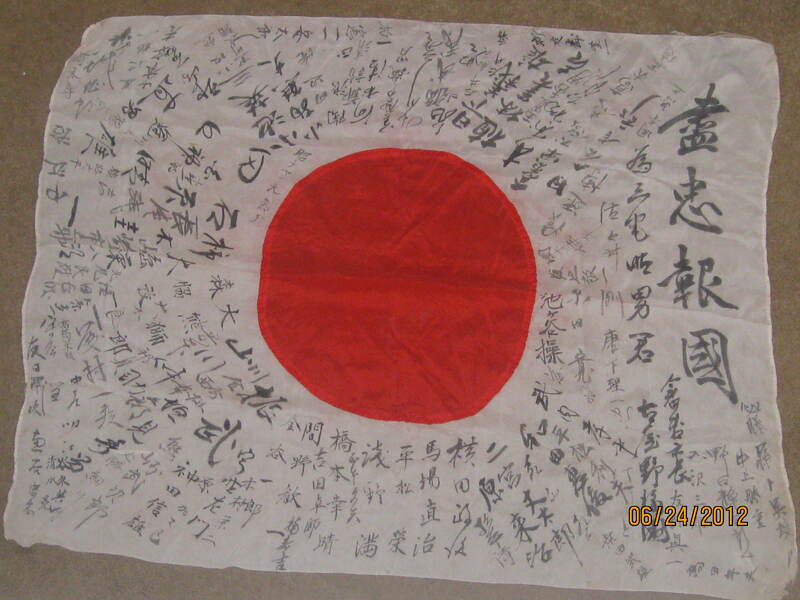 Apparently, a gentleman had in his family’s possession a captured Japanese flag. Presumably, someone in his family brought it back as a souvenir. Of course, if an Allied soldier brought one home, it may have been removed from a corpse. In the best case scenario, it was taken from a prisoner. You just didn’t find them laying around on the battlefield. Dad on Saturday enjoying a “youkan”, or sweet bean jelly. He has a pretty good sweet tooth. According to the request, the owner of the flag stated he wanted to return it if possible to the family. Not an easy task – even for “I Dream of Jeannie”. These flags were created at the farewell party of a soldier who was going to be dispatched to the war and certain death. There is usually the name of the person for whom the flag was presented. If you are lucky, the flag may have a city or town written. I’m sure my Uncle Suetaro received one. 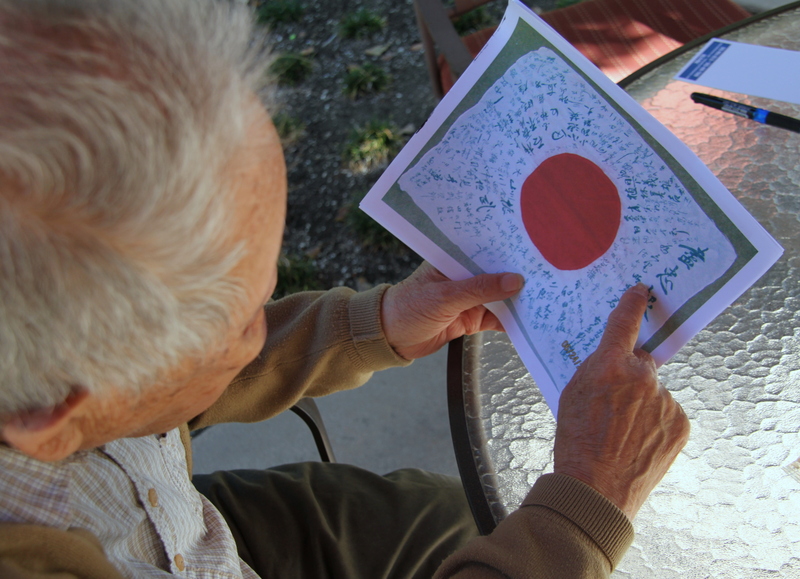 Anyways, Dad – and while his glasses were shattered in the fall – was able to say the person for which the flag was signed was likely for a Mr. Tokio Miyake. Unfortunately, there was no true town or city named specifically. Nevertheless, we were able to make out what appears to be “Kurayoshi Mayor”, or the mayor of “Kurayoshi”. Last night, I did a little reserch and almost unbelievably did find a town named Kurayoshi. I tracked down the town’s website and sent a blind email (in my broken Japanese) to the mayor’s office and asked if there was a mayor named “Furuya” during the war. While my Dad did not participate in the hostilities, his Nisei unit did their job and greatly shortened the war according to General MacArthur. The Nisei’s job was a true secret weapon. Hopefully, this no longer secret weapon can serve some peacetime good and bring two families to peace. Oh. 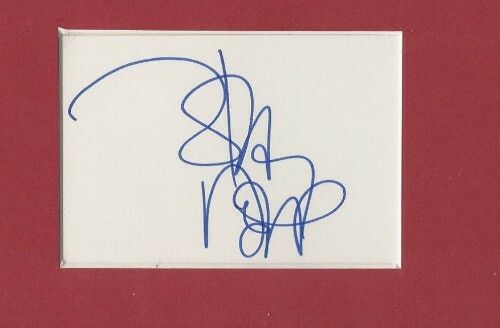 That was Johnny Depp’s signature. Thought you ladies may like that. There be gold in my family. Really. Well, the Congressional Gold Medal, that is. And it is made out of gold and honors the “Nisei Soldiers of World War II”. Its on display at the Smithsonian. In fact, my family was awarded two of them. Two Congressional Gold Medals. Pretty neat, don’t you think? Three if you include a distant relative. Four if Dad had enlisted in the Army five weeks earlier. OK. Enough of that. It was just a miracle mom and her younger sister Eiko survived the war having lived in the heart of Tokyo where very little was left standing. My grandmother was required to train with a sharpened bamboo spear to repel the invaders that were expected to come. It’s true. But when war ended in 1945, neither my mother nor my Aunt Eiko could have possibly thought that they – through no grand scheme – would each end up marrying an “invader” and that they would end up living in America. The country that bombed their home into ashes. But it was a brutal war. Just fact. Taken on December 8, 1946 in Tokyo. (L to R) Mom, Taro, Aunt Eiko. Standing are my grandparents. Notice the US 8th Army shoulder patch on Taro. Isn’t he handsome? He was 21 years old. 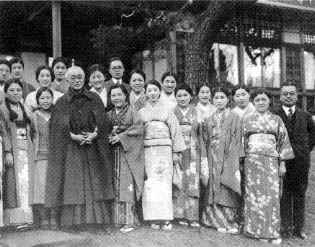 The first family member bestowed the Congressional Gold Medal is my mother and Aunt Eiko’s cousin, Taro Tanji; he is pictured above in a family portrait taken in Tokyo. He was born in Merced County, CA. Taro, like my father, was imprisoned in the camp called Granada in Colorado for being of Japanese heritage although he didn’t speak one word of Japanese. 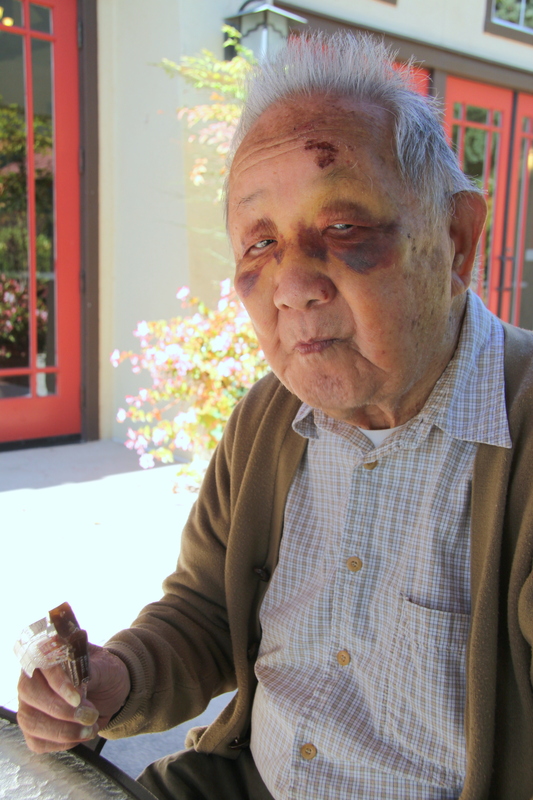 In 1944, along with thousands of other young American boys of Japanese heritage, he was drafted out of the camp into the US Army. He was a “Nisei”. He then was assigned to the top secret US Army Military Intelligence Service Language School (MISLS) in Fort Snelling, Minnesota to learn the Japanese language. 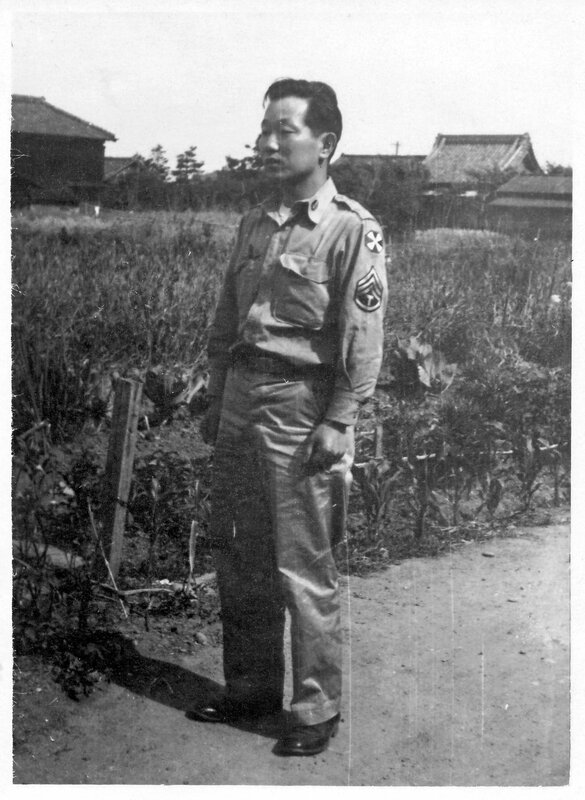 After graduating, he was assigned to Tokyo as part of US 8th Army and became part of the Allied Occupation. Once there, he immediately sought the fate of my mother’s family. Through the resources of the MIS, he miraculously located my grandmother – the same one who was forced to train with a bamboo spear. They had survived but were in dire straits like millions of other survivors. Exactly as my father did for my cousin Masako in Hiroshima, Taro used whatever pay he had to buy them clothing and essentials from the PX, took them C-rations and of course, American cigarettes for my grandfather. There are many stories of other things Taro did (he was a STRONG man) which I will save for later. 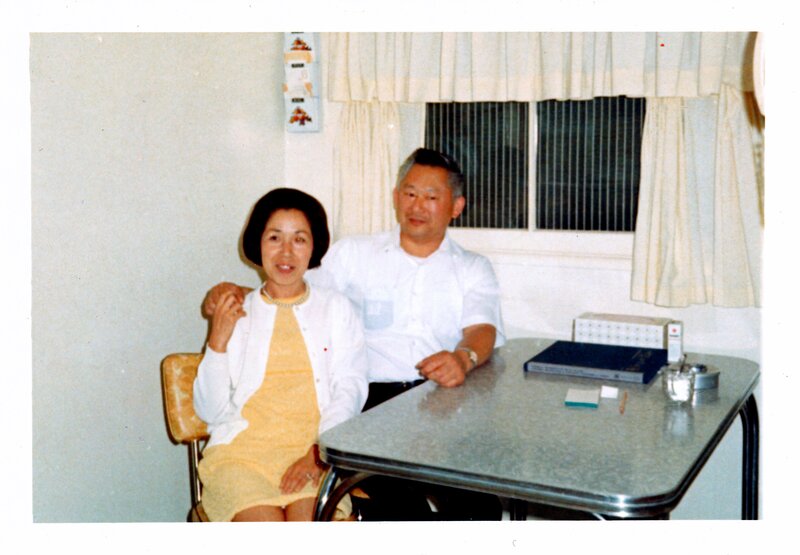 Aunt Eiko and Taro, taken in the late 1960’s at his home in Gardena, CA. A kind man, Taro became a much loved teacher in the Gardena school system. He recently passed away in Gardena, CA in 2009. His CGM was posthumously awarded to his wife, Aunt Martha. Amazingly, neither mom nor Aunt Eiko realized Taro was part of the MIS until I told them. I determined that through research of US Army records. My Aunt Eiko was sickly as a young girl. Indeed, it was a miracle especially for her to have survived. She hates medicine, even to this day. As a funny story, when the US Army began de-licing the surviving Japanese citizens, she ran away as she was terrified she would get sick from the powder. Well, it was DDT so she wasn’t that far off. In 1966, she met Paul Sakuma, a Hawaiian born Nisei. 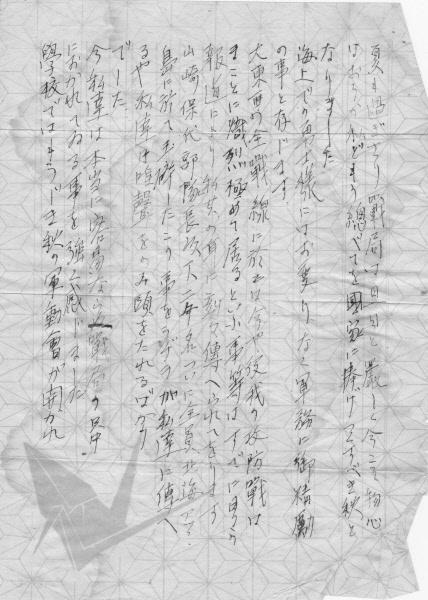 While Uncle Paul told Aunt Eiko he was also put into camp on the Mainland (the article says that, too), I can find no record of his internment. However, Uncle Paul was at some time in Springfield, Massachusetts after the war started. He was “featured” in this newspaper article. Surely, the title of the article was a sign of the times. Newspaper article on Uncle Paul during war time, Springfield, MA. Uncle Paul was also drafted in 1944 and was also sent to the MISLS at Fort Snelling, Minnesota. This is the only photo Aunt Eiko has of Uncle Paul in uniform. I stumbled across it last year. Frankly, Aunt Eiko also knew very little of his Army days but I noticed the building in the background (below) as being the old cavalry barracks at Fort Snelling which sparked my researching again. He was also indeed a member of the famed MIS unbeknownst to Aunt Eiko. Uncle Paul at Ft. Snelling’s top secret Military Intelligence Service Language School, circa Winter 1945. The old barracks is seen in the background. 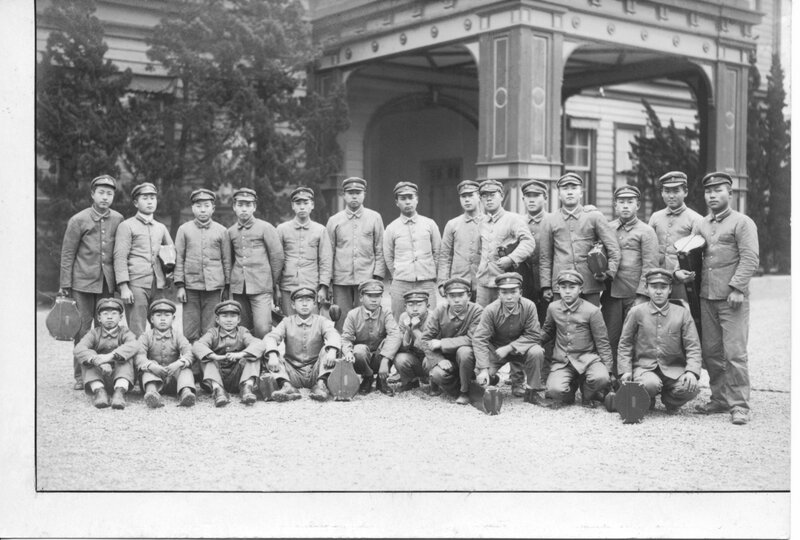 Uncle Paul was also immediately dispatched to Tokyo as part of the Occupation Force. He was assigned to the 720th Military Police Battalion and accompanied patrols where his translation abilities were needed. A couple of good patrol stories – ones that men would likely appreciate. Perhaps some ladies, too. No harm, no foul, as the great Chick Hearn said. Days before my first marriage, I got a call from Aunt Eiko late at night. She was hysterical. Uncle Paul had died of a massive heart attack in 1980 in Tokyo in the new home he had just finished building for them. He had continued living in Tokyo as a civilian employee of the USAF. 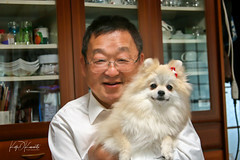 Like Taro, Uncle Paul was posthumously awarded the CGM. I secured the CGM and surprised her with it. Aunt Eiko “cried for happy” as he held the medal for the first time early this year (below). She loves him greatly to this day. She said, “Even today, Paul brings me great happiness.” If that doesn’t bring a tear to your eyes, well, you’re pretty tough. Holding Uncle Paul’s Congressional Gold Medal for the first time, Aunt Eiko cried for happy. Incidentally, she became an American citizen about ten years ago. As dad volunteered in February 1947, he did not qualify for the CGM. But unbelievably, mom, too, did not know much of what dad did in the Army let alone him being a member of the MIS. Mom said dad never talked much about it except to say he did not enjoy interrogating Japanese soldiers being returned from Russia and Manchuria. Nevertheless, mom and Aunt Eiko WERE enmeshed with the famed Military Intelligence Service although they didn’t realize it. Fate. 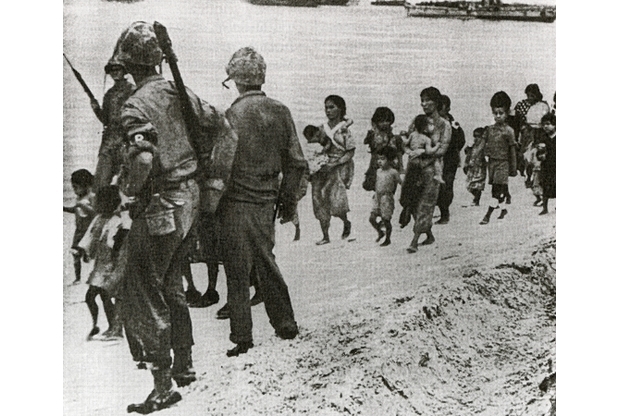 They were surrounded by the invaders – secretly. Famous ones at that. A prejudiced opinion, of course. I am very proud of these Americans. The Congressional Gold Medal is a tremendous honor and finally brings to public light the importance of the intelligence they secretly obtained for our United States of America amidst prejudice and discrimination. I like to think that these Americans of Japanese heritage weathered the clouds of that time so we could have glorious sunshine today.